Although, we never know what a new year will bring, it is easy to look back at the stats of the year gone by and give appreciation for what we were able to conquer. I must say this has been the strangest year I’ve had in a long time. I have never had a DNS prior to 2012. I have never had an event downgraded to a lesser distance. I have never had an event cancelled. I have never had to deal with such a lengthy injury. I have never had an injury (as an adult) which totally took me out. But I handled it all. Learned a lot. And it has made me even more ready to tackle 2013. Some people are constantly looking & searching for the next best thing. They want each year to be bigger and better. I, however, just strive for a good year, with good health, and good friends. 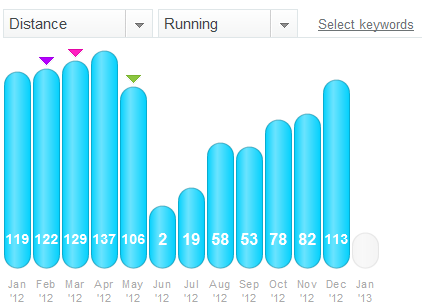 I feel lucky to be out there just slugging out the miles with everyone else, regardless of pace or distance. I am thankful for the time. I am thankful for the ability. I am thankful for the experience which just allows me to appreciate my desire to keep running after all this time. I’m not settling. I’m just thankful. This entry was posted in Cross Training, Cycling, Running, Triathlon and tagged 2012 in numbers & stats, miles biked, miles ran, Recap of 2012, thankful for ability to run, thankful for desire to run, thankful for lessons learned by tootallfritz. Bookmark the permalink. I’m surprised you put those DNS’s on there. They don’t define you, except that you were smart enough to make the best choice for your health. I’m so glad that I got to spend some time with you in 2012, and looking forward to STARTING 2013 with it!! Wishing you an injury free, fun, exciting 2013. I’m so glad to call you friend. You always inspire and motivate me, and I thank you for that. 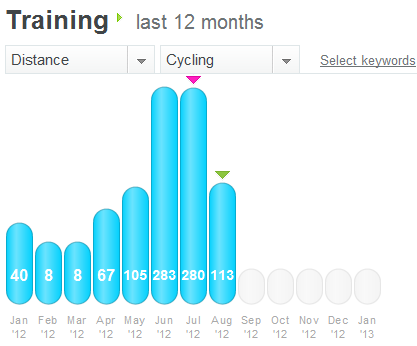 And, random, but you can tell EXACTLY where tri season ended in your cycling timeline, lol! Wonderful outlook! I admit I get stuck in the bigger and badder routine…I learner my lesson this year though! Yes, Thank you!!! Every year I am thankful for all the new and current running friemds, they so understand me so much more than everyone else……I do get frustrated (B@*#@)with my injuries….but very thankful I am able to run again. Jusr so hard to get back to your pace and condition, that you worked so hard to be in, looking back you know it’s obtainable again…just hard. No one said it was easy, and that is where my running friends come in, They are all so inspiring!!! Hopefully I have learned from them also….Thank you Amanda also for the smiles along the way!!. Thanks…thanks…thanks! DNS….far better than DNF! Every year can’t be our best year, but you made 2012 a smart year by listening to your body. Someday when I grow up, I hope to do the same 🙂 Cheers to a happy running 2013! Such a good reminder! I always want to do it better or bigger but maybe that’s not in the cards. What I can do is pretty great and I CONSTANTLY forget this! Cheers to grateful year!